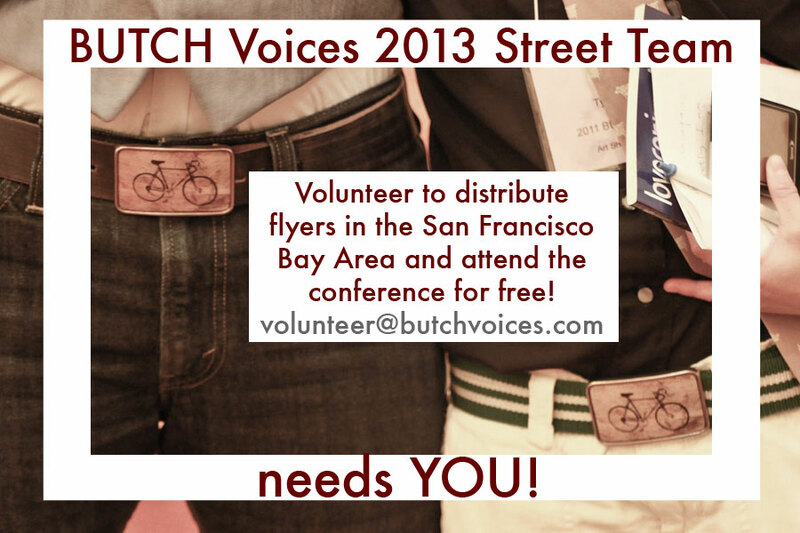 Opportunities available with BUTCH Voices: 2013 Street Teams! Posted June 30, 2013 by BUTCH Voices. 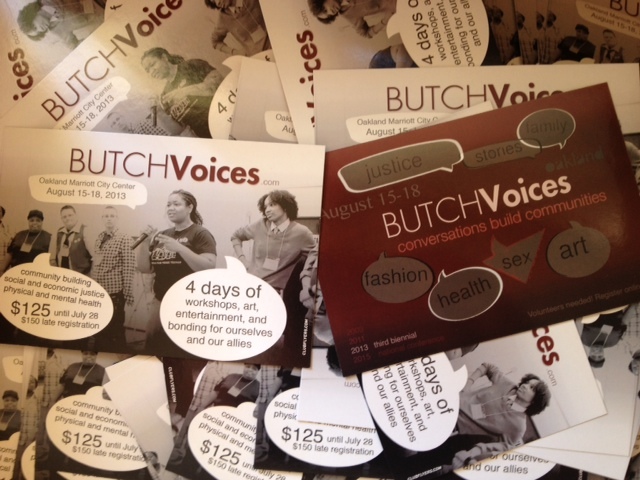 BUTCH Voices 2013 national conference postcards are here! And we’re making street teams to distribute them! Want to be part of it? Help us out? Get some credit and attend the conference in exchange? Read on! Oakland, CA: BUTCH Voices, the organization which will host its third national conference August 15-18, 2013, in Oakland, California, has opportunities for volunteers to distribute flyers throughout the San Francisco Bay Area in July. BUTCH Voices Street Teams are being formed in Dallas, Seattle, Portland, Toronto, Boston, New York, San Francisco, and Oakland. “We’ll have Street Teams in all cities where 2012-2013 BUTCH Voices Community Conversations took place,” said Meg. People interested in participating in Street Teams should contact the Volunteer Coordinators at volunteer@butchvoices.com. Postcard-sized flyers will be provided to you by mail and you must have them distributed by the beginning of August.